Most outdoor grilling areas have a patio made of brick, stone or other type of concrete. Cleaning those areas don’t always require an expert to come to the location and use high-powered equipment, which can be costly. With the exception of concrete, those surfaces can be easily be washed with water, bleach and a garden hose. Most home improvement stores have power washer attachments to use with the garden hose for more water pressure. Dilute bleach and water in a large bucket. Either dump the solution over an area on the patio or use a spray bottle to spray the solution. Allow the solution to dwell for a few minutes. Use a scrub brush and handle to scrub the area. Wash the solution away with a hose. Not only does this method clean the patio, it kills mold and mildew that may have accumulated over the winter months. For concrete areas, use concrete cleaner. Worldwide Janitor’s ready-to-use concrete cleaner can also be used on as asphalt or black tops. 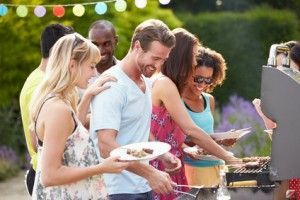 Nothing is more impressive to guests and customers than a sparkling clean grill or outdoor oven. Before you start the grilling season, take the time to clean the grill. If you’re grill sits outside during winter months with a cover on it, pests and sometimes rodents take refuge in the grill to avoid the harsh winds and snow. To clean an outdoor grill or oven, always disconnect and remove the heat source, such as a propane tank. For a charcoal grill, remove any remaining charcoal or ash. Lay the removable parts of the grill on an area that is safe to be sprayed with chemicals. This can include grill racks, flame covers and grease collection containers. Spray the parts with a degreaser and allow it to dwell to assist in penetrating tough grease and burnt areas. While the parts of the grill are soaking in degreaser, dilute a degreaser in a bucket of warm water – approximately 1/3 degreaser and 2/3 water. Wearing protective gloves, wash the outside of the grill and its storage departments. Rinse it with warm water. After the removable parts of the inside the grill have dwelled, use a scrubbing brush to remove the stuck-on grease and residual particles. Rinse everything off with a garden hose or a hose with a powerwasher attachment. Allow everything to dry and reassemble the grill. For stainless steel grills, spray the stainless steel with stainless steel cleaner. Wipe the stainless steel with a lint-free cloth to shine and protect it. Like most kitchen equipment and accessories, equipment used to dispense water and other liquid drinking products require cleaning. They often accumulate lime scale from hard water and even become a bacteria, mold and other potentially harmful germs that can cause sickness. Not only will cleaning this type of equipment sanitize it, it also makes them run like new and provides a clean, refreshing taste. Even if the equipment is clean and either unused for several months or never used, cleaning the equipment removes any particles such as dust, improving the overall quality of the drinking products. No matter what type of equipment you’re cleaning, always remove the filter if it has one. If the filter requires replacing it, you should consider replacing it when you clean it. For equipment such as water coolers, it’s important to sanitize the unit as often as possible. This can be done by simply removing the water container and flushing boiling hot water through the system. Most tap water is considered “hard water”. To avoid lime deposits going thru the system, boil filtered, distilled or spring water and flush it through the system. To clean coffee makers, there’s a simple solution – use white vinegar. White vinegar can be used on any type of coffee maker, whether it’s a standard, household coffee maker or industrial coffee maker. Fill the water contain in the coffee maker with the same amount of white vinegar as if you were adding water. Turn the coffee maker on and allow it to perk. After it’s completed, drain the white vinegar out and fill it with water to clean out the white vinegar. Drain the water out of the coffee maker and repeat the process until the smell of white vinegar no longer lingers in the coffee maker. Grilling and general outdoor serving utensils often sit unused during cold months. It’s always good to clean those utensils before using them again for the new season. Utensils can cleaned simply using hot water and dish detergent. Allow them to dry. If the utensils are used occasionally, store them in a plastic container or large sealable plastic bag to keep them free of dust or debris. This entry was posted in Degreasers, Dishwashing, Food Service and tagged degreaser, dishwash, grout scrub brush, Pure Bright Bleach 10%. Bookmark the permalink.